From customized upgrades, patented designs, and OEM-engineered systems to reverse engineered parts and assemblies, we offer a full range of innovative solutions for your manufacturing needs. Even your equipment that is running with no issues may be ready for improvement in ROI, labor saving, or safety. Industrial Manufacturing engineers have experience in identifying and upgrading enhancements in your equipment or parts where design changes can result in increased performance and an improved bottom line. Your partnership with Industrial Manufacturing brings instant access to expertise familiar with the entire life cycle of your equipment – and a proven track record of adding value to your operations. From our inception, we have been an engineering and design company. With over 80 years of collective experience in mechanical engineering, Industrial Manufacturing can offer a tried and tested approach to keeping your plant operational. Our custom-engineering solutions cover a wide range of industrial operations in the Food & Beverage, Pulp & Paper, and Industrial industries, and our proven experience covers a full range of applications, including project planning, manufacturing, commissioning, walkdowns, upgrades, and OEM product development. Industrial Manufacturing is quoting a customized retrieval system to more quickly and efficiently recover product from defect jars for reintroduction into the manufacturing process. The machine direct function is to use centripetal force to recover product from defect jars at a faster and more efficient rate. 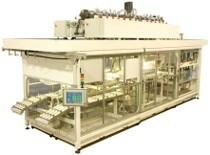 After lids and seals are removed, the jars are loaded into the machine manually. Each jar size requires a customized tooling set based on parameters. Speed: Based on current functioning installed base, Industrial Manufacturing estimates that throughput speed should increase ≈500% for jar sizes both under and over 56 oz. This speed increase should decrease both throughput time and labor required to recover the peanut butter from your jars, as labor utilized in this function could be applied in other manufacturing operations. Labor: As the proposed process is based on automation, Industrial Manufacturing is confident that the current setup of two employees involved in the recovery process can be reduced to just one. Moreover, we are also confident that the overall man hours per day (on an ABC basis) will be reduced by 90% or more due to the overall processing speed of the proposed solution. Moreover, the substantial man hour reduction also enables you to utilize labor in this process (based on our estimated throughput) in other areas, as we expect the reclamation process to be only about two hours/day (assuming the current process utilizes eight hrs/day to reclaim peanut butter. Efficiency: The use of centripetal motion to empty the jars is an inherently more efficient way of emptying the jars than simply “digging” it out with knives, spatulas, or other means, as in addition to speed increases, less peanut butter is left over in the jars. Based on prior models operating in the field, Industrial Manufacturing estimates that as little as 2% of the product will remain in the jar after a three minute cycle – a far better amount than current methods of emptying and recovering your product. Sanitation Risk: By automating the process, any risk of contamination by human interaction/error will be minimized. Labor Savings: Using estimates based on previous installations and two specific jar size ranges smaller than 56 oz and larger than 56 oz, as well as time assumptions for manual operations of 30 cycles/hour (or 30 jars/hr) for jar sizes less than 56 oz, and 20 cycle/hr for jar sizes larger than 56 oz, Industrial Manufacturing can provide a customized product for your operations that can provide a payback of less than two years based on labor saving, efficiency and throughput speed. Industrial Manufacturing offers a diverse array of custom-designed material handling products to address your manufacturing critical needs. Offered in a range of customized sizes, designs, and configurations, we can provide a balance of cost and versatility that precisely addresses your material handling needs. INCLINE & TUB INFEED CONVEYOR (W/ DUMP SYSTEM) – This project was awarded by a US-based supplier in 2003, and is still operational with minimal maintenance costs today. Industrial Manufacturing also continues to support the project thorough routine maintenance and support as requested by our customer. The system was designed to concurrently handle two types of paper – reject parent rolls and rejected converting rolls. It was also designed to handle trimmed ends from log saws and continues to do so today (as designed). BEARING MATERIAL HANDLING SYSTEMS – This system was designed on request for a customer to automate a bearing handling system and reduce issues with “nicking & denting” in the process. By designing a handling system that reduced overall friction and systemizing the handling of the bearings, Industrial Manufacturing was able to reduce the quality control issues by over 99% and automate the process in one project.